It’s naturally to experience some stress and anxiety here and there, but when it becomes chronic it can start to cause health issues, not to mention just be downright annoying. Following a healthy diet is one thing you can do to help manage stress, but the following foods are specifically known to do so. Low levels of folic acid in the diet have been linked to depression, and one totally natural food that is particularly high in it is asparagus. Folic acid is also referred to as B-9, and it’s a water-soluble nutrient so you don’t have to worry much about over doing it through your diet. In fact because it’s water-soluble that means that we need to get some into our body every single day to keep up our stores. If you don’t already have a favorite recipe for asparagus, simply grilling it with a small amount of olive oil and salt is extremely tasty for a side dish. You already know that oranges are a great source of vitamin c, but did you know that vitamin c can help to lower the stress hormone cortisol in the body? It’s true, and it can also help to reduce blood pressure. It’s best to get the nutrients straight from a whole orange, but if you’re going to go with a squeezed juice make sure that it’s fresh or at least doesn’t have any sugar added. Sugar can actually increase the levels of cortisol in the body (and quickly), which means sugary orange juice doesn’t come in so high on the health factor. Fish that is high in omega-3 fatty acids such as salmon helps to protect the body against adrenaline spikes when you feel stressed. Keeping your adrenaline levels in check can help keep the levels of cortisol in check as well. Those healthy fats are also filling and satisfying, which can make fish an appealing choice when you’re trying to stick with leaner meats but have to eat loads of chicken to feel full. 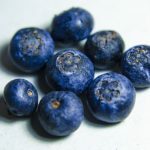 Blueberries are one of the most common mentioned fruits when it comes to antioxidants, but really any high antioxidant fruit could fall into this category. The key is the antioxidants combined with the vitamins. Those nutrients are key for rebuilding the cells at all times, but especially when we’re stressed. Some studies suggest that blueberries actually boost the levels of serotonin in the body, which can directly counteract the feeling of anxiety. Blueberries are easy to come by and they’re obviously delicious on anything from oatmeal to salads. Avocados are high in the b vitamins, and they’re also a good source of healthy fats. Healthy fats like monounsaturated ones paired with potassium are great at lowering the blood pressure, which is key when you’re stressed and fired up. You could also argue that avocados are simply so delicious that they’re bound to make you happy and therefore reduce stress. Except of course when you have to pay exorbitant prices for guacamole.